Ovi Suite has received an update and you can download this over at Nokia Beta Labs. 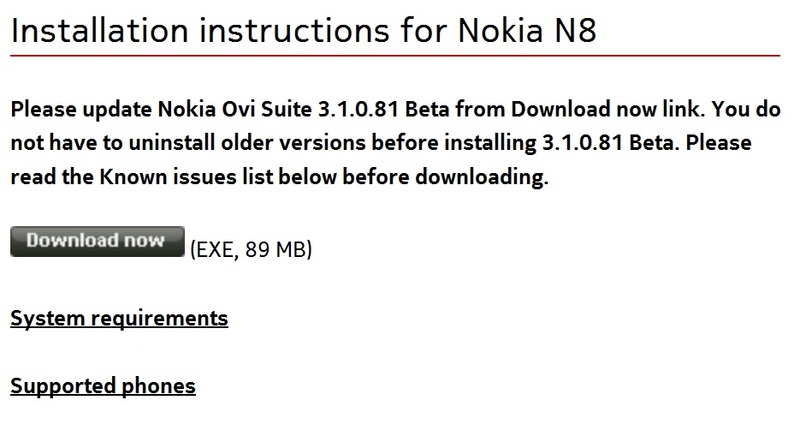 Note as usual, the latest version of the Ovi Suite that you download from Nokia (non-Beta) is at 3.0.0.290. 3.1 has been around since March in Beta Form, with 1.0.74 available in April. If you are still on the standard Ovi Suite, here are the changes again to expect should you want to try 3.1. This update to 3.1.0.81 is quite minor. 3.1.0.81 Beta includes an important fix to S40 device software update bug which was already reported here. This version also includes many other error corrections in various areas and stability fixes. Updating your phone software and mobile apps takes place more easily. Now, you can update both in one go. Downloading apps, games, and more from Ovi Store is now even simpler. When you choose to download something from Ovi Store through Nokia Ovi Suite, the direct link to the selected item is sent to your phone. You can then go on to download the item using your phone. There’s no need to open a web browser on your desktop anymore. Viewing the results of your latest sync is now possible in the Sync log view. In this view, you can see all the details that were added, updated or deleted and where each of these changes took place. Syncing with Microsoft Outlook has been improved with critical fixes. We’ve put lots of effort into this and we’re looking forward to your feedback on the results. Creating the connection between your device and computer is now more reliable. Sending text messages to groups is now possible. You can create contact groups in the Contacts view and easily send messages to all the members of a specific group in the Messaging view. Playing high-definition videos captured with your phone takes place in a more optimised and smooth way. Keeping track of your map downloads is easy. Click Downloads in the Maps view to view your download queue. I found issues with syncing my N8 (possibly there was too many photos for photosync?). I’m a drag and drop file digger myself. I prefer accessing the memory and files directly over USB mass memory. I’d bluetooth but my stupid new laptop won’t connect. Fortunately my mum doesn’t have to use Ovi Suite again as the bluetooth connection started working again. I’ve just advised to connect every once in a while to back up. Cheers Shahmiri1407 for the tip! « Video: Nokia C2-01 review. And a mini Rant.